Successfully Added Elephone EleCam Explorer Elite - 4K Video, NTK96660 Chipset, Sony IMX 078 CMOS Sensor, 170 Degree Lens, IP68, (Black) to your Shopping Cart. The Elephone EleCam Explorer Elite is an ultra high quality 4k action camera that lets you record all your adventures in stunning quality. 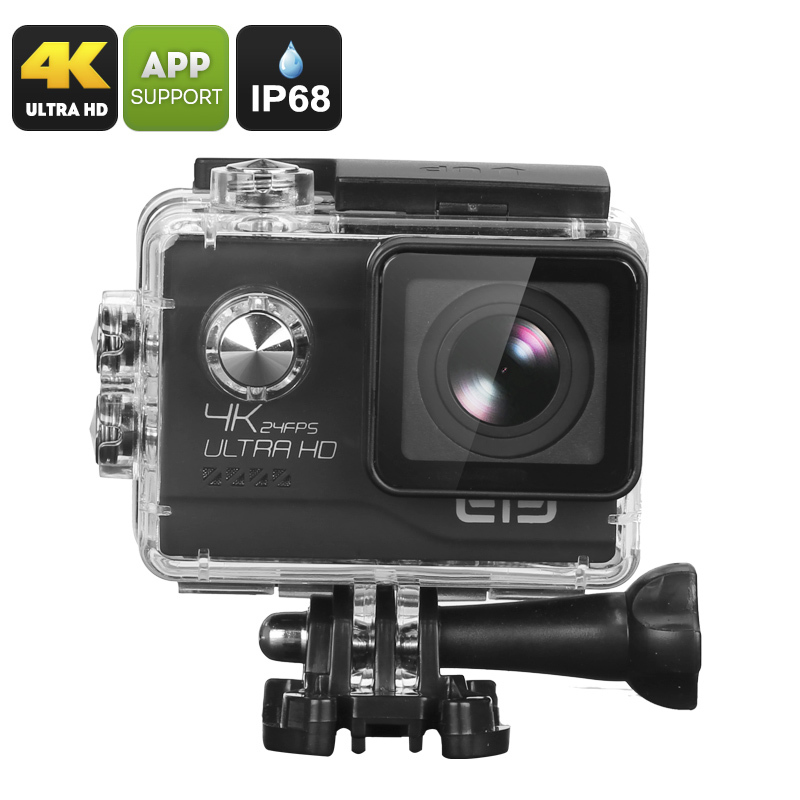 Whether you’re out skiing, hiking, or diving, this amazing little 4K sports camera allows you to capture and share all your greatest memories in mesmerizing detail and quality. Featuring a powerful Sony IMX 078 COMS Sensor the Elephone EleCam Explorer Elite action camera snaps among the sharpest footage out there. Whether it is 4K video or stunning 20MP photographs, with this sports camera you can be sure of a great result. Along with its improved and top notch NTK96660 chipset the Elephone EleCam Explorer Elite allows you to conveniently record ultra-clear 4K footage and is furthermore capable of recording high-speed scenes in breathtaking detail. The possibility to shoot high quality photographs additionally enhances your user experience. Whether you shoot at day or at night, in the mountains or under water, this 4k sports camera is guaranteed to deliver stunning 20MP pictures. Coming with an IP68 rated waterproof case this action sport camera can be used up to a depth of 30 meters under water, making it the perfect companion to bring along on your next surfing or diving adventure. Equipped with a powerful 1050mAh battery this sports camera offers up to 1.5 hours of continuous usage time, enough to capture a days worth of adventures. Additionally its Wi-Fi connectivity allows you to instantly share all your recorded adventures with friends and loved ones located at the other side of the world. With its 170 Degree wide angle lens this 4K action camera offers you a platform with an excellent shooting vision. Along with its anti-shake feature this high definition sports camera guarantees to deliver clear and stunning footage no matter where in the world you are recording. Capture all those unforgettable moments in life in stunning 4K quality – with this 4K sports camera you will be able to share and recall your favorite memories like never before. The Elephone EleCam Explorer Elite action camera comes with a 12 months warranty, brought to you by the leader in Action Cameras as well as wholesale electronic gadgets..
Arabic: - ك 4 الرياضة عمل الكاميرا - Chinese Simplified: - 4 K 体育行动相机 - Czech: - 4K sportovní akční kamera - Danish: - 4K Sport handling kamera - Dutch: - 4K sport actiecamera - French: - 4K Sport Caméra d'Action - German: - 4K Sport Action Kamera - Hebrew: - מצלמה פעולה ספורט 4K - Hindi: - 4K स्पोर्ट्स क्रिया कैमरा - Italian: - 4K Sport Action Camera - Japanese: - 4 K スポーツ アクション カメラ - Korean: - 4 K 스포츠 액션 카메라 - Malay: - Kamera tindakan sukan 4K - Norwegian: - 4K Sports Action-kamera - Romanian: - 4K sport de acţiune aparat de fotografiat - Russian: - 4K камеры действий спорта - Spanish: - Cámara de acción deportiva de 4K - Thai: - กล้อง 4K กีฬาการดำเนินการ - Turkish: - 4K spor eylem kamera - Vietnamese: - 4K thể thao hành động.